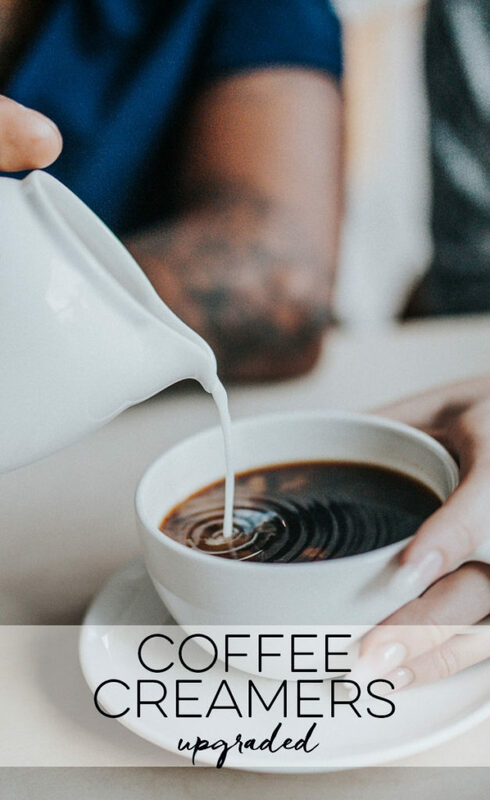 Last week we dove into the world of coffee; the good and the not so good of this staple beverage. Coffee drinkers are serious about their coffee, they know how they like it and what they like it with. If you’re someone who likes a little creaminess in your cup of joe, then it can get problematic if you’re avoiding dairy. Many people are sensitive to dairy or find it negatively impacts their digestion, skin and more. In Prescribe 20 we ask members to go dairy-free for 20 days to see how they feel, but what’s one to do if they need creaminess in their morning cup? Today we’re sharing our favorite upgraded coffee creamers. Partially Hydrogenated Soybean Oil: This is a trans fat, and these fats are the most brutal kind they dramatically increase inflammation, the risk of heart disease and depress thyroid function Note: may of these are legally allowed to say they are “trans fat free” because the serving size is so small. But don’t be fooled: COFFEE-MATE [ok we blew the whistle] contains trans fats! Sodium Caseinate: A milk derivative that stabilizes shelf life. Question anything that extends shelf life. Good food goes bad. Dipotassium Phosphate: Can’t pronounce it but declared safe by the FDA. Mono & Diglycerides: Emulsifying fats, that some people refer to as the next trans fats. Depending on product: Silicon Dioxide, Sodium Stearoyl Lactylate, Soy Lecithin, Artificial Flavor, Artificial Color – non foods. In a nutshell, COFFEE-MATE can last two years with no refrigeration, and stays fresh for two weeks once opened – working well in offices but not in your body. The creamy texture and seasonal flavors don’t make up for the fact that you are putting vegetable oil into your coffee. Ready for another option? We recommend people use coconut milk [full-fat or lite], nut milks [we love Califia Farms brand] or hemp milk. Here’s a few even fancier options for people who take their coffee very, very seriously. Blend in a food processor or blender and pour into a jar. Store in the fridge and add a spoonful or two to your morning cup. Strain and rinse the hazelnuts with water. Add the rinsed hazelnuts to a high-speed blender with the water and remaining ingredients, blend on high for 1 full minute or until nuts are finely pulverized. Strain the milk through a nut milk bag, pour the milk into the cloth and squeeze! Keep the creamer in a sealed jar in the refrigerator for up to a week. They won’t taste like half and half but they will taste amazing. Give one of these a try, and if you’re gearing up to commit to Prescribe 20, get one ready for your fridge! This way you won’t have to feel like you’re missing out on your morning routine. Enjoy! Love this! Giving up dairy in my coffee has been the hardest part of going dairy free for me. Love these options, thank you!! You bet! So happy you enjoyed the post. cheers! Looks amazing and can’t wait to try, but where does one find a nut milk bag? I think I’ve seen them at health food stores or Whole Foods but also found them here! Hey ladies! Can you recommend a fab coconut milk and creamer? Gearing up for PN20! Hey Erin! We love all canned coconut milk (just store in a jar after opening with tight lid). Our favorites are Native Forest and Thai Kitchen. If you want a Coconut Creamer try the Califia Farms one – it’s amazing! Thank you! I love Thrive Market, too!